Lavender already used by the Romans in ancient times for its flavor and its therapeutic qualities, lavender is now one of the medicinal plants most popular in herbal medicine, especially for nervous problems, digestive or joint. Mild narcotic effect (coumarin): insomnia, hysteria, nervous disorders. Antispasmodic effect, thanks to the esters that the plant contains. Gastrointestinal disorders: digestive problems related to stress or nervousness, ulcers. Respiratory disorders : colds, asthma. Soothes if dizziness. Cardiovascular disorders: a quiet start of angina. Treatment of migraines and headaches. Relieves certain skin conditions: eczema, acne, minor burns, psoriasis, insect bites. Heals and cleanses wounds and ulcers. Joint pain : sprains, strains, contusions and rheumatism. Action on venomous viper bite. Pest control (lice) and worming. Irritation and / or inflammation Respiratory. Bactericidal and effective antiseptic, it cleanses wounds and skin ulcers. Pest control, it eliminates lice . Neutralizes the venom in case of viper bite. Its essential oil is used in massage therapy. Lavender is native to the western Mediterranean basin. Antiquity The Romans already used to perfume the baths and linen. St. Hildegard of Bingen, the twelfth century, gave him a place in his natural medicines and, at the same time, we made culture in monasteries for its therapeutic properties. From the Middle Ages, lavender was used in Provence in the manufacture of medicines and perfumes. From the nineteenth century, this aromatic plant has seen its culture to develop in several European countries and in America. 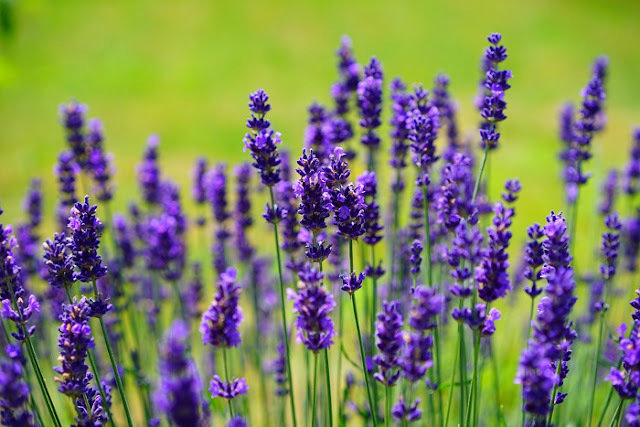 The Grasse region of France, is now the "capital" of lavender, because of its high production of essential oil of this plant, which is used in herbal medicine but also in perfumery. It also grows in the following countries: Portugal, Spain, Balearic Islands, Somalia, India, Sahara and Australia. Lavender is a small broadleaf shrub of the family Labiatae (or Lamiaceae), which measures 30 to 60 cm in height; its branches are thin and woody and found the narrow, pointed leaves at its base only. The flowers of the lavender, soft blue or purple and shaped like small petals, are grouped into terminal spikes and give off a pleasant scent. This plant only grows in rocky terrain, but well drained, calcareous and sunny. They are found throughout Mediterranean Europe, sometimes even up to 1800 meters, especially in the Alps of Provence. Excellent honey plant, lavender is popular with bees. The flowering tops are the only part taken on this plant. Phenolic Acids; Terpene alcohols: Linalool, Geraniol; Périllique Alcohol; Coumarin; Umbelliferone; Tannins; Esters; Oxides; Ketones; Aldehydes. - In the dry micronized powder (capsules): 1-2 g daily in three divided doses. - Dry extract (capsules): 200 to 400 mg daily in three divided doses. - Infusion: 2 tsp. tea in 150 ml of hot water. Up to 3 cups a day between meals to counter or prevent digestive problems and to relieve migraine, dizziness or angina beginning. - Tincture: for local frictions in the case of joint pain (morning and evening). - To cleanse the scalp by rubbing lightly with your fingertips, three times a week. - In oil massage: 2-4 drops per 60 ml of neutral base (eg sweet almond oil) to relieve related pain strains, sprains and muscle cramps. - By inhalation to counter insomnia and nervousness, 2-4 drops poured in a diffuser or 1 or 2 drops on a cotton wool placed in a pillow. Although the essential oil of lavender can be applied directly to the skin, it is recommended to mix it with a base oil such as sweet almond oil, when the person has a very sensitive or reactive skin (irritation, itching). Lavender is not recommended for people taking natural products or drug anticoagulant effect. The lavender is not suitable for pregnant women in the first three months of pregnancy. It knows no known adverse reaction to lavender. Moreover, some people react too strongly to its narcotic effect, though light. Lavender is incompatible with iron salts and iodine. Do not consume lavender, by infusion or otherwise together with anticoagulants (due to coumarin it contains). The known benefits: Lavender is recommended, especially for people with nervous disorders or insomnia. It proves soothing to treat skin problems such as dermatitis, eczema, psoriasis and acne. Lavender essential oil applied in calm massage joint and rheumatic pain. A little dried lavender infusion in a cup of hot water aids digestion, especially among people nervous. Combined with iodine or iron salts, lavender showing significant toxicity. In 1991, a study conducted in Vienna clearly confirmed the slightly narcotic effect of lavender when used to promote sleep or soothe an anxious state. It would not only olfactory way, but also directly on the nervous system. Other research has come to the conclusion that essential lavender oil reduce blood pressure and certain physiological markers of nervousness and stress (eg, increased cortisol levels). Clinical trials have shown that because coumarin anticoagulant properties, lavender was the synthesis of prothrombin in the liver. US researchers are currently studying the effect of limonene and périllique alcohol contained in lavender to combat certain forms of cancer. Results from studies on animals have shown that lavender soothed spastic reactions. A herbal medicine study concluded that, combined with other essential oils (thyme, cedar, rosemary) to perform a scalp massage, essential oil of lavender can help treat alopecia and alopecia areata.